When the weather gets cooler, and the urge for comfort food hits, chase away the autumn chill with these sensational autumn dishes. Cosy up in the kitchen and make the most of seasonal flavours that everyone will love. The wonderfully fragrant smell of spices cooking recipe will really get you in the mood for food with this delicious pilaf. This is a quick easy recipe to make but the resulting dish is warm and comforting and is packed full of vitamins and goodness. Radishes are delightfully low in calories and being a low GI food help to fill you up and provide you with slow release energy. This is a great meal for all the family – though you may like to serve the youngest in the family before scattering the chopped chilli on top! Heat the oil and butter in a large saucepan with a tight fitting lid, add the onion, garlic, cumin, fennel and black onion seeds, cook for 3 minutes, stirring every now and then until the onions are translucent. Now add the rice and cook for a further 2 minutes until the rice has also turned translucent, stirring the rice all the time. Add the pumpkin and stock, bring to the boil and turn down the heat to a gentle simmer. Season and place the lid on the pan and leave to cook without stirring for 10 minutes, or until all the stock has been absorbed, turn off the heat and leave to stand for 5 minutes to finish cooking. Turn a dreary day into a special occasion with a bowl of warm, hearty stew, always a welcome sight on a cold day. When the chicken has all been fried, turn the heat down and add the leeks and Chantenay. Fry for a couple of minutes, then return the chicken to the pan, along with the herbs and garlic. 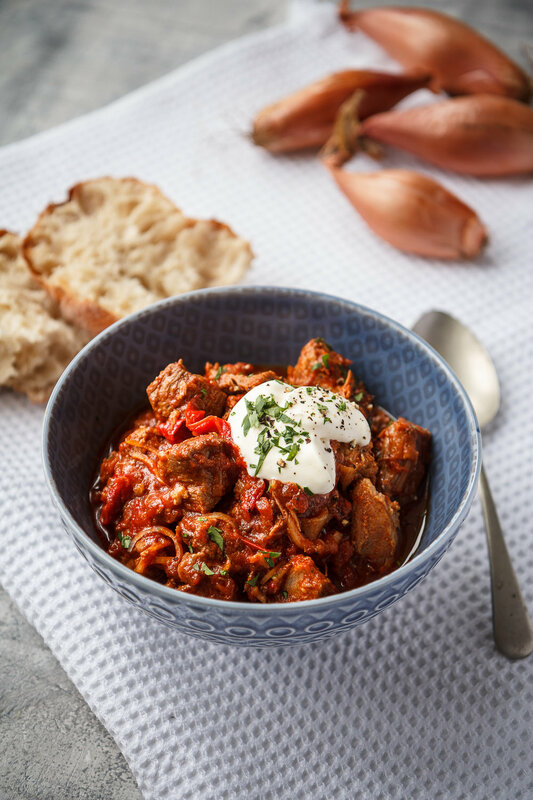 A comforting and hearty Hungarian-inspired slow cooked stew to chase those winter chills away. Once the meat has all browned, return it all back into the pan, along with any juices from the plate. Add the shallots and peppers and fry together for couple more minutes. Add the garlic, paprika, caraway, tomatoes and water and season well with salt and freshly ground black pepper. Bring up to a simmer then transfer to the slow cooker and leave to cook on high for about 8-9 hours or until the meat is really tender. Alternatively, cover with a tight-fitting lid and slide into an oven set to 100°C (fan temperature) for the same amount of time. This simple red lentil dal recipe is comforting and easy to make. The fragrant cumin, coriander seeds and the sweetness of cinnamon will make beautiful aromas that fill the air. Spread the quartered tomatoes on a baking sheet and sprinkle with sugar, salt and pepper. Drizzle with 1tbsp olive oil and bake in the oven for 30 minutes. Let the tomatoes cool a little and then tip them into a deep bowl and roughly blend with a stick blender. Meanwhile, to make the tadka, heat the oil in a frying pan, add the spices and cook for a couple of minutes, stirring now and then, until the mixture smells toasty. Add the shallots and cook, stirring often, for about 10 minutes or until they are soft and lightly browned. Season with a little salt. Pour the dhal into a serving dish, top with the onion tadka and serve. This is a recipe all of the family will love. You can reduce or omit all of the chilli altogether if your taste buds can’t handle the heat. Either way this recipe is guaranteed to become a family favourite. 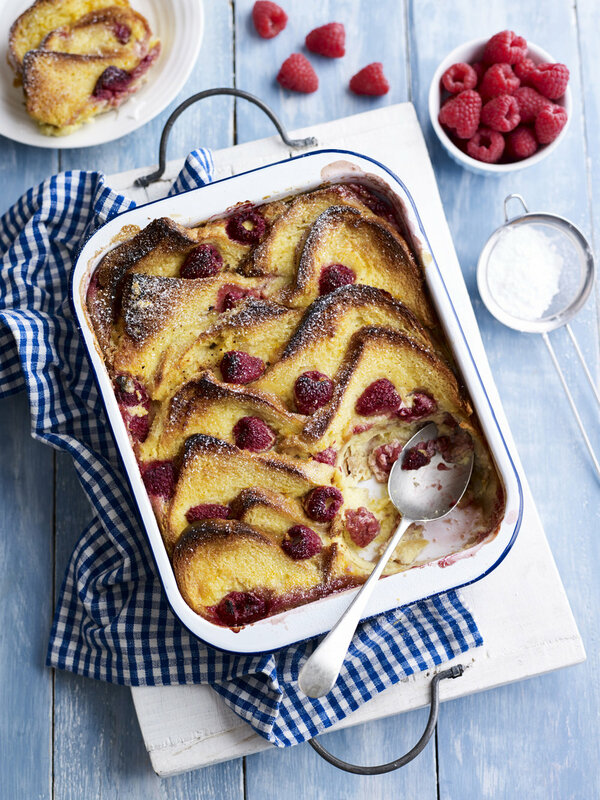 This pudding has a sharp fruity flavour from the raspberries with lovely sweet brioche. Try with ice cream for added indulgence. Butter the brioche and cut the slices in half diagonally. Lay half of the slices in the bottom of a large ovenproof baking dish so that the corners overlap. Mash half of the raspberries with 3tbsp of sugar and spread over the brioche. Arrange the rest of the slices over the crushed raspberries then scatter over the remaining whole raspberries, tucking them in between the slices and nestling in any crevices. Beat the eggs in a bowl or large jug then beat in the remaining sugar, cream, milk and orange zest until well combined. Pour all over the brioche. Heat the oven to 170C/150C fan and allow the pudding to soak while the oven comes up to heat. Once hot cook for 35-40 minutes so that the centre of the pudding has a wobble but there’s no runny liquid. 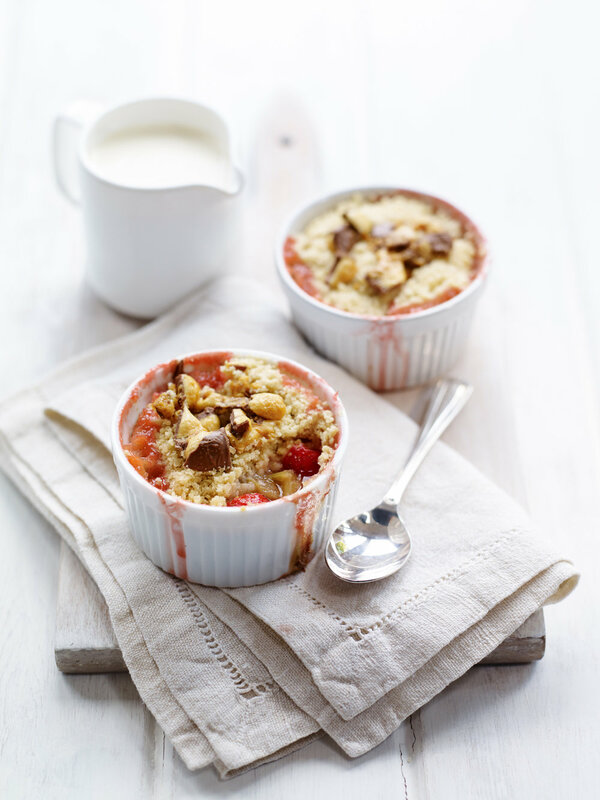 Roughly chopped fruit with a dash of ginger wine and a crunchy bar crumble topping! This pudd is a great way to warm up on a chilly night. Halve the strawberries the place all the fruit and rhubarb syrup into a baking dish.